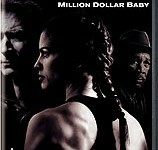 In the wake of a painful estrangement from his daughter, boxing trainer Frankie Dunn (Eastwood) has been unwilling to let himself get close to anyone for a very long time – then Maggie Fitzgerald (Swank) walks into his gym. In a life of constant struggle, Maggie's gotten herself this far on raw talent, unshakable focus and a tremendous force of will. But more than anything, she wants someone to believe in her. The last thing Frankie needs is that kind of responsibility – let alone that kind of risk – but won over by Maggie's sheer determination, he begrudgingly agrees to take her on. In turns exasperating and inspiring each other, the two come to discover that they share a common spirit that transcends the pain and loss of their pasts, and they find in each other a sense of family they lost long ago. Yet, they both face a battle that will demand more heart and courage than any they've ever known.